This is a warming and tasty thick potato soup recipe with a touch of cream and cheese for a dreamy comforting starter or light meal. The humble potato makes this a very economical dish and it is substantial too with the addition of cheese. You can use a good hard swiss cheese but a good cheddar will also be suitable. · Melt the butter in a heavy bottomed pan, large enough to hold all your ingredients. · Sweat the onions, garlic and vegetables in the butter over a low heat for about 10 minutes. · Add the stock, turmeric and salt and pepper to taste. · Bring to the boil and then simmer in a covered pan until they are tender. · Remove half of the vegetables with a slotted spoon and reserve. · Put half the vegetables through a blender or a fine sieve to make a purée. · Pour the purée back into the pan with the other vegetables and bring to the boil. · Pour in the cream gently, stirring continuously and mix in half of the cheese which is best grated at this stage. 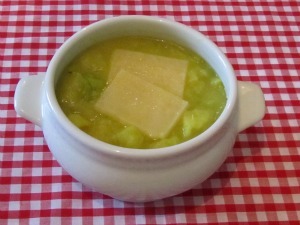 · Serve your soup hot with a couple of slices of cheese on the top. For more potato recipes why not try leek and potato soup or if you want a lovely cool soup for either summer or winter, a delicious vichyssoise is a good choice.